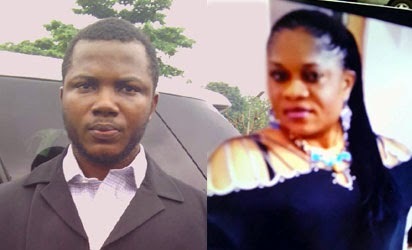 LAGOS — The 31-year-old man, who allegedly strangled his 39-year-old international business woman lover to death in her apartment at Green Estate, Amuwo Odofin area of Lagos, last month, told a crowd yesterday that he did it out of jealousy. The suspect, Kelechi Williams, who was paraded at the Lagos State Police Command, was arrested at the border between Ghana and Cote D’Ivore by operatives from the Area ‘E’ Command, Festac Town and those of International Police, INTERPOL, while fleeing with the deceased’s Range Rover Sports Utility Vehicle, SUV, with number plate LAGOS EKY 509 AZ. The incident, according to him, occurred on July 19, 2014, at about 2 am during an altercation over the late arrival of his lover, a mother of four identified as Njideka Lizzy Nzewe. Narrating how he snuffed life out of the deceased, the suspect, who hails from Umuji in Ndemili North Local Government Area of Anambra State, said: “Lizzy was my girlfriend. I knew her three years ago. But we started getting serious in February this year. “I came back from Ghana to visit her on July 16, 2014 which was on a Wednesday. The next day we went out and came back late. “On Friday, she told me to stay back at home and rest because I was tired. She left the house, saying she was going to the new apartment she was to pack into, assuring me she would be back as usual by 6 p.m.
“But she did not return by 6pm. Rather, the gate man came with a power generating set, saying madam had gone to drop the workers. “When it was 8 p.m. and I did not see her, I started calling her on phone but she did not pick. I called her up to 30 times without response. “She came back by midnight and when I asked why she did not pick my calls, she said the phone was in silent mode. I brought out my phone and called her line only for it to ring. “Immediately she discovered it was a male’s voice, she snatched the phone from me and asked why I should pick her calls. I reminded her of a similar incident when she came to visit me in Ghana and my phone rang. She pick it and on discovering it was a female, she smashed the phone on the ground, without knowing who the caller was. “I reminded her also that she collected my other phones from me and brought them to Nigeria. In anger, I took the phone and smashed it on the ground. “Before I knew it, she threw my things outside, saying I should leave her house. I told her to give me the N300,000 she borrowed from me to buy an air conditioner, if she wanted me to leave but she said she had no money with her and gave me her ATM card which she said had just N140,000. “At a point, she slapped me and we started fighting. She held on to my manhood and started stretching it. That was when I held the wrapper that was around her neck and used it to strangle her, thereby forcing her to let go my manhood. She fell down and became motionless. “Immediately, I took her three phones, ATM card and went outside to meet the gate man to see me off to any ATM machine, where I withdrew N100,000. “I dropped the gateman at home, and told him I was going to pump the tyre. At that point, I knew I was in trouble. I did not go back to her house for fear of being arrested. “I drove straight to Mile Two, from where I picked a driver who drove me down to Ghana. I spent some days in Ghana before I decided to leave for Cote d’Ivoire,where unfortunately I was arrested. Briefing newsmen earlier, the command’s boss, Umar Manko, said after the suspect killed the woman, he locked the door from outside, apparently to make it look as if they had gone out. He further disclosed that a new International Passport which bore the suspect’s name and the surname of his deceased’s lover, was found on him, suggesting that the motive was pre-empted. Back in Ghana, preliminary investigation, according to the Police, revealed that the suspect took the SUV to church, declaring it was his. Police sources said he made an unspecified donation to the church and also threw a party to celebrate the new car. On his part, the gate man, John Tungwim, said he suspected something was amiss when the suspect dashed out from the apartment that night. According to him, “he told me he was going to the club with madam but that she asked him to go and withdraw money with her ATM card first. “I went with him because I know madam’s pin code. But we came back, he told me to go inside that madam said she was tired and could not go. So, he drove out alone.